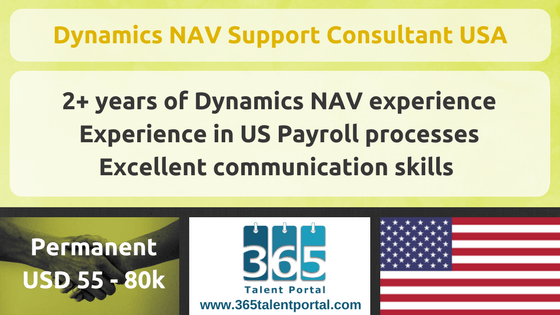 Dynamics NAV Support Consultant position is only for those who are located in the US. Train and support clients on Microsoft Dynamics NAV 2013R2 and 2016. Strong communication and organization skills. Must speak fluent English and be easily understood by all. Part of the team supporting implementation and ongoing support of the financial modules and payroll (Kenek/Serenic). Knowledge of US payroll rules and processing is essential. 401-k plan with matching contribution. The company match is fully vested from day one.